PEX is a term that refers to cross-linked polyethylene. It is a form of flexible plumbing tubing used for both hot and cold water supply lines. Thanks to its flexibility and ease of connection, PEX is gradually becoming the preferred pipe for residential and commercial uses. 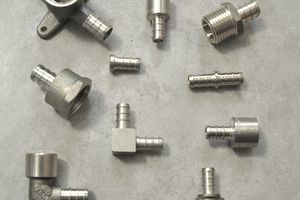 There are several types of PEX fittings and connectors. Unlike other forms of plastic plumbing pipe, PEX fittings form mechanical unions; they are not solvent-glued in the same manner as is used for CPVC and other plastic plumbing pipes. There are several manufacturers of PEX tubing, and each offers their own complete line of fittings. There are also third-party fittings available that normally can be used with any manufacturer's PEX pipe, but following the PEX manufacturer's recommendations is important. Use fittings rated by a certified third-party testing and listing agency, such as NSF, IAPMO, CSA, IGL, or UL. Connection methods vary from manufacturer to manufacturer, but typically they fall into one of five categories. Some connection methods require a specific tool designed for that method. Large home improvement centers, as well as online retailers, stock most of these connection fittings as well as the required tools. PEX crimp fittings are the standard type of fitting used in PEX systems. A large variety of fittings are available to make PEX-to-PEX connections, as well as transitions to other pipe materials. Most crimp fittings are made of brass (manufactured to ASTM F1807 standards), but poly-alloy crimp fittings (sometimes called poly-plastic) are also available (manufactured to ASTM F2159 standards). Crimp fittings require copper or stainless steel crimp rings and a PEX crimp or clamp tool. Some manufacturers use O-rings on their metal fittings (manufactured to ASTM 2434 standards) to make the seal with the tubing. Crimp fittings are compatible with all types of PEX tubing, except for PEX-AL-PEX. Crimp fittings are preferred for many applications since they are widely available and are the most affordable. Compression fittings for PEX operate in much the same way as compression fittings for copper or other plastic piping. The fittings consist of three parts: a compression nut, a compression ring, and a compression insert. Making the connection involves placing the compression insert inside the end of the PEX tubing, sliding the compression ring over the tubing, then securing it with the compression nut. As it tightens, the compression nut presses the ring and the tubing against the insert, forming an absolute seal. Compression fittings are easy to install and disassemble, making them popular among plumbers and contractors, as well as DIY homeowners. They are, however, more expensive than crimp fittings. Compression fittings are well suited when you are dealing with multiple connection points, or where disassembly is anticipated. Push-fit fittings (sometimes called push-to-connect) are a relatively recent plumbing innovation that is growing in popularity for all types of plumbing pipes, including PEX. Connecting PEX tubing with push-fit fittings requires no special tools or crimp rings. A special multicomponent locking mechanism allows you to push the PEX pipe into the fitting where it is gripped and sealed. That same mechanism allows you to remove the fitting, usually by means of a special disconnecting tool. Push-fit fittings are commonly manufactured from brass or DZR brass and are compatible with all types of PEX tubing, as well as copper and CPVC pipes. The Uponor ProPEX system, which includes expansion fittings, PEX sleeves, and a special expander tool. The components are manufactured to ASTM F1960 standards. The Rehau RauPEX system, which includes proprietary expansion fittings, an expander tool, a compression tool, and brass sleeves. These fittings are manufactured to ASTM F2080 standards. Note: Expansion-style fittings can be used only with PEX-A tubing and are not compatible with other types of PEX tubing. Press fittings are similar to crimp fittings, but here the fittings are structured so that no outer crimp ring is needed. Instead, once the PEX pipe is placed over the press-fitting sleeve, a press tool is used to squeeze the tubing until it locks to the inserted sleeve. Press fittings are available for either PEX tubing (Viega press system, including FostaPEX) or PEX-AL-PEX tubing (Watts, Uponor). The systems are proprietary and must be used with the manufacturer's own press tool. Where possible, install PEX tubing to minimize the number of fittings required, as this will minimize the potential for leaking and disruptions. Wherever possible, bend the tubing to change directions, rather than making right-angle bends with fittings. Use manifolds to feed multiple PEX lines from a single supply pipe. Group plumbing fixtures together whenever possible. Minimize tubing lengths when planning your layout. Choose the right PEX pipe diameter for the application. Use PEX color coding. Hot and cold lines should be color-coded differently—the standard practice is to use blue for cold and red for hot water lines. Bundle pipe runs together to reduce installation time. Plan transition points for efficiency. Make sure connection points are accessible. This simplifies any future maintenance that might be necessary.